Based in Jerez de la Frontera, one of the cradle cities of flamenco in southern Spain, Domingo Ortega is known for his riveting performances as a soloist and innovative choreography. 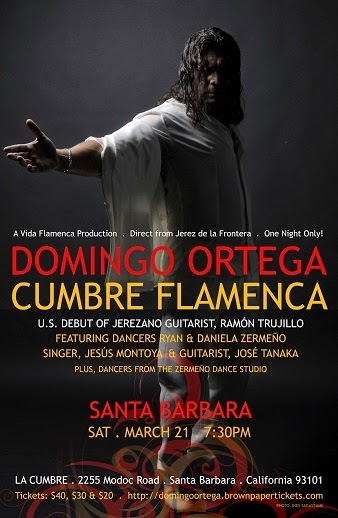 The show name "Cumbre Flamenca" meaning Flamenco Summit represents the dazzling display on tap at the newly renovated La Cumbre Theatre at 2255 Modoc Road in Santa Barbara on Saturday, March 21 at 7:30pm with tickets available through http://domingoortega.brownpapertickets.com. Flamenco dancer, Domingo Ortega was born in 1969 in Jerez de la Frontera, where he learned his first steps and started his professional career. Domingo was outstanding as a soloist in the Albarizuela ballet. He received the prize for the best flamenco dancer in the national competition of Ubrique and also, in the Cadiz province competition in 1989 and 1990. In 1991 he became part of Carmen Cortes’ company and later on worked with other companies such as Manuel Soler. As a soloist he has collaborated with companies such as Antonio Vargas, el Guito, and Luís Davila (Luisillo). His solo career started in 1992, dancing as a special guest in the many famous tablaos (Café de Chinitas, Zambra, Casa Patas, and El Cordobes). In 1993 he took part in the production “Cinco Bailaores." In 1998 he received the prize “Copa Teatro Pavon” for young performers and in 1999 he was presented by Cristina Hoyos in the Teatro Central de Sevilla as one of the most outstanding flamenco dancers in the present day. In 2000 he debuted “…y ahora me voy con mi mare” with his own company in the Nuria Espert Theatre, Fuenlabrada, (Madrid). In 2001 the Company went to Japan and Israel with the same show and then to California for the Irbyn Festival. In all these places the performance was met with positive reviews and great public success! This success for Domingo Ortega is not just as a flamenco dancer, but as a choreographer as well. In 2002 Domingo was an invited artist for the show “Medea” in Tokyo and in 2003 Domingo brought his 11-member company to Hollywood's Ford Amphitheatre for the Vida Flamenca production "Orfeo." He continues to share his artistry through teaching here in the U.S., Canada, Italy, Japan, Venezuela and Israel. This promises to be an unforgettable flamenco show, as Domingo Ortega is one of the most prominent dancers of his generation.